When money is tight and needs to be squeezed a little more, it may feel like a hopeless task. Pinching pennies and squeezing a few more out isn’t easy, but there are a few ways you can do it and possibly find a few more dollars to save out of your budget. As a single mom, I have found that I often have to re-evaluate my budget and find a few more places to cut a dollar here, a dollar there. Here are a couple of ways I cut back and pinch those pennies ’til they scream. Okay, yeah, eating out should be completely cut out of a tight budget, but when you’ve got kids there are times when you try to stretch a few pennies to treat them every once in awhile. For the occasional treat, check around your local fast food places and other restaurants for special deals. Some of the restaurants in my town have special nights during which there are discounts for kids. During certain times of the day, some fast food places offer half-price drinks, which is usually when I will try to treat my kids to a soft drink. Another option for a trip through a fast food place would be to order meals to share and no drinks. Fill water bottles from home to drink. I have also found that my kids are happy if I just make a trip through a fast food place to get an order of French fries for each person. This isn’t free, but it’s cheap and satisfies the need for some comfort food. One of the best ways to save money on clothing is to swap with friends. I am fortunate in that I have close friends with children of staggered ages with my three. We pass around shoes and clothing to save money for everybody. When one child outgrows something, or someone needs something specific, we all go into our clothing storage to see who has something that will meet the need. This is a great way to save money while getting the most use out of clothing items (you know how it is–kids grow so fast that some things just never get worn out!). Another method for saving money on clothing is taking the time to learn to sew. Even learning minor sewing to mend small tears, replace buttons and adjust hems can help you make your clothing last (especially if you are dealing with hand-me-downs and swapped clothing). These are just a couple of ways to stretch your money. 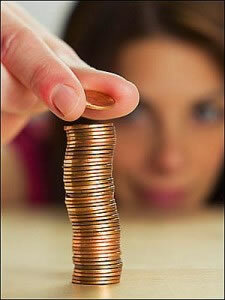 Keep looking for more ways to save your pennies and keep reading for more ideas.